Do you want to transform your congregation? Sing the Mass! May 11, 2016 / Karl Henkel / Comments Off on Do you want to transform your congregation? Sing the Mass! Singing the Mass adds less than 3 minutes to the length of Mass, yet it completely revolutionizes congregational participation. By directly engaging the congregation with simple dialogues and prayers, the priest cultivates a heightened liturgical experience. My colleagues and I meet regularly with our pastor to reflect on the weekend experience of attending Mass at our parish. We have even begun discussing this topic as part of our monthly Liturgy Committee meetings. How did you experience the Mass? Did you encounter hospitality, prayer, inspiration, community, engagement, a sense of purpose? Reflecting on these questions is a great way to take time to be grateful for the Mass and for the fact that we can gather together and worship God through His Son, Jesus Christ. What have we done to deserve such riches? Who am I that God would lavish me with his love through this beautiful prayer: the Mass? The weekend experience: the Mass: when Heaven meets Earth. All Saints: does this generation want to sing the Mass? November 1, 2015 / / Comments Off on All Saints: does this generation want to sing the Mass? Today, we sang the Mass to celebrate the Solemnity of All Saints. For the last two years, we have sung the Mass at one of the scheduled Masses for every holy day. When I imagined this particular Mass, I envisioned the normal 9:30 am congregation joining in the dialogue chants with gusto as they have done in the past, accepting the extra singing in light of this joyful feast of All Saints. However, since we haven’t had a holy day for awhile, today felt like we were really doing this for the first time. Other aspects made singing the Mass feel more cumbersome to me than it has at other times. For example, the 9:30 am Mass crowd filled the church to capacity with people sitting in extra chairs and standing in the back. Two issues, the time change and Halloween, made the 9:30 am Sunday Mass an especially popular Mass time this weekend. The 9:30 am Mass is always full, but today it was crowded and that changed the vibe. People weren’t sitting where they normally do. The 9:30 am regulars were outnumbered by visiting parishioners. In our parish, when we gather like this (this also happens at weddings, funerals and at Christmas and Easter), when we gather in a different manner than the norm, our usually confident congregational singing weakens. These factors made our Mass chants and music more choir led than I would have liked, even though our pastor did a great job leading the sung orations and the choirs sang well. What is the good that is being accomplished by singing the Mass in a crowded church where most of the people aren’t prepared to participate in this way? I could argue that with repetition, people would be more able to participate, but singing the Mass makes the Mass last longer, so it isn’t something that we will do every week. Or, I could say that the greatest good is that the choir members have learned how to sing the Mass. 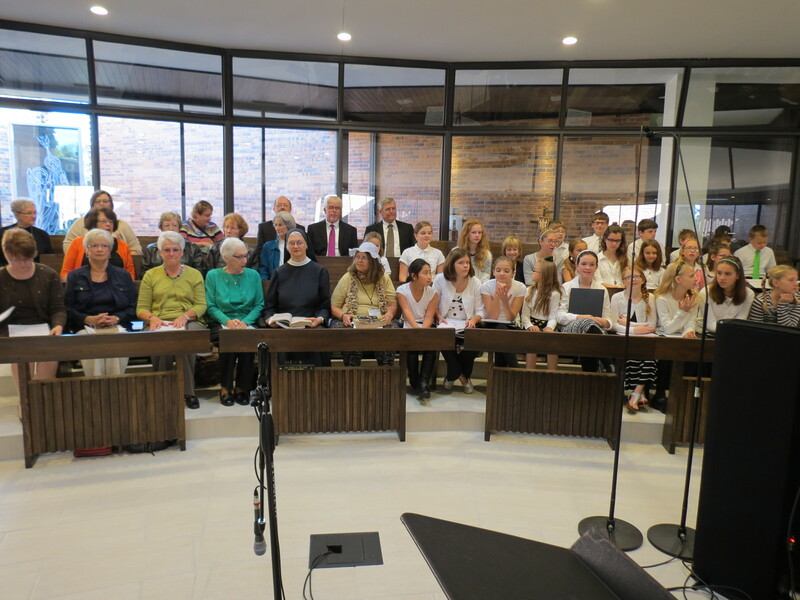 The choir members consist of youth and adults who rehearse weekly. Learning to sing the Mass in rehearsals helps form their liturgical spirituality, helps them to contemplate the beauty of the Mass. Finally, I would argue that this is what we are asked to do by Mother Church: sing the Mass. From the first popes to the second Vatican Council, the Church asks us to sing the Mass chants. However, in light of overwhelming current practice of not singing the Mass, these arguments aren’t compelling. They don’t promise an obvious objective good, like increased collections, or increased attendance by non-church goers. A colleague and I frequently discuss how to successfully evangelize today. I appreciate my colleague’s insights and wisdom. He meets with people in all walks of life through marriage prep, baptism prep and RCIA. I admire his understanding of where people are spiritually. He shared with me that, in his experience, good evangelists have a knack for listening as much as talking. They listen in order to learn about the person they would like to evangelize: listen to their story, their concerns, their life experience. A less successful type of Evangelist draws from his own experience and projects that onto everyone else. Sometimes, converts fall into this trap as they have experienced great joy in becoming Catholic and are ready to force others to experience that joy. This is soapbox evangelism, in your face evangelism. I remember as a child visiting New York City and seeing an evangelist on a street corner standing on a box and shouting out the Gospel to the city. What an incredible witness to love, but also what a very limited tool for evangelism. I try to argue that zeal is attractive, but it’s obvious that there is truth in what he is saying. So, is singing the Mass an example of in your face evangelism? An attempt to put the liturgy on a soapbox? I think of this in light of the titles of a couple of Matthew Kelly books: Rediscovering Catholicism and Rediscover Jesus. The order of publication of these books shows the problem that we face today as Catholics. The author wanted to share his Catholic faith with disheartened Catholics, ergo the first title. However, the feedback received from this attempt showed that it is not just that Catholics don’t know about Catholicism (which is true), it’s that they don’t even know about Jesus, ergo the second title. In this way, one could argue that singing the Mass really misses the mark in terms of what normal Catholics are able to appreciate, and that all this chanting actually discourages them by making participation in the Mass more demanding and tedious. Each of us face these issues every time we try to share our faith. How do we make our faith attractive to this generation? In this case, how do we make the sung Mass a tool of the new evangelization? A great example of the New Evangelization in Catholic music is found in Fr. Samuel Weber. Just as Bruce Hornsby (see previous post) mastered the music of Bill Evans and then re-shaped it so that his friends would be attracted to it, Fr. Weber mastered the Graduale Romanum and re-shaped it to attract English speaking Catholics. The Graduale Romanum is the Catholic Church’s song book. In Latin, in Gregorian Chant notation, this book contains the chants of the Roman Rite sung at Mass. Here is a youtube of one of my favorite cantors, Giovanni Vianini, singing an example from the Graduale. The second Vatican Council promoted Gregorian chant so much that the Council Fathers called for an updating of the Graduale to match the new conciliar liturgical calendar, and published it in 1974. Fr. Weber, possessing a thorough understanding of Gregorian chant, and aware of how few English speaking Catholic parishes are singing from the Graduale Romanum, composed an English gradual (The Proper of the Mass for Sundays and Solemnities) to help Catholic musicians discover the music of the Roman Rite. It would be difficult to overstate what this collection does for English speaking Catholic musicians. Fr. Weber sets each proper antiphon in four versions from complex (inspired by the Latin original) to simple (psalm tones) so that any musician can successfully sing the propers. Before, one had the option of struggling and failing to pull off the challenging original Latin chant (which requires sustained study from dedicated singers) or singing simple psalm tone English adaptations. Here is a recording of the 3rd option for the Communion proper for the 29th Sunday in Ordinary Time. My wife and I became Bruce Hornsby fans soon after we were married. What I like about Bruce is that he has great piano chops and can demonstrate stunning hand independence. At the same time, Bruce is a grand story teller. His lyrics evoke longing and nostalgia, tapping deep human memories and core experiences. In an interview with Marian McPartland on Piano Jazz, Bruce described how he studied jazz in school and loved the music of Bill Evans. However, Bruce realized that his friends didn’t find Bill Evans cool. Evans’ music was too difficult to listen too. Thus, Bruce endeavored to make Bill Evans relevant, again, by arranging Bill’s music in a style that his friends would like. Isn’t this what we need for the New Evangelization? Disciples who study and love the Truths of the Catholic faith and who endeavor to find new ways to share this Treasure with their friends.